The winning proposal aims to bridge the gap between speech-therapy patients and their speech therapist. Last year's TES Dragon's Den competition. It was barely 6pm, the start time for the Trinity Entrepreneurial Society’s (TES) flagship Dragon’s Den event on Thursday, when audience members were asked to move along and fill all empty seats in the Synge Theatre. 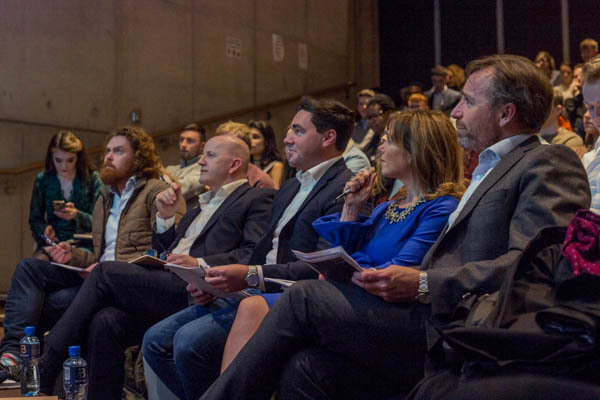 The event would see six finalists compete for a cash prize to invest in their burgeoning companies, its popularity evidenced by a constant flow of attendees into the theatre. Though the prospect of winning Trinity Ball tickets certainly provided incentive for student attendance, the standard of the presentations at hand would certainly inspire the entrepreneurial-minded. Five-minute pitches proposed a range of ideas, from equestrian to tech, each team holding their own under questioning from the Dragons – or rather, two real Dragons, and three celebrity judges. Among these were RTE Dragons Eamonn Quinn and Ramona Nicholas, Trinity’s Head of Student Entrepreneurship Gavan Drohan, and Zach Dutton, the founder of Unifund who backs student startups. It is perhaps telling of the culture of the business world that all of the competitors, along with a majority of the audience, were male students. TES, however, emphasised the calibre of their female judges: Nicholas who is the Executive Director of Cara Pharmacies as well as a Dragon, and Sarah Tully, from the event sponsor Bank of Ireland, a Trinity graduate herself. For the competitors, the €7,500 prize fund alongside a place on Trinity’s LaunchBox 2019, and €2,500 for the runner up, were certainly worth fighting for. The competition opened with third-year business students Brian O’Mahony and Charlie Butler, already winners of Trinity’s Launchpad Sprints programme. Their app Bounce would provide instant feedback to companies about target marketing, and see users gain awards points for engaging in game-ified feedback surveys. A student-geared product, their pitch was centred close to home, with a prospective rewards system that would provide students with discounts at familiar cafes or restaurants like the Perch, or the Science Gallery. Described as “market research for the smartphone generation”, Bounce, as an opening pitch, was a hard act to follow. Daniel Carroll and his company Caballis, however, made a solo pitch in a departure from the techy, app-centred idea of entrepreneurship. His all-natural horse treats, made in a variety of molasses-free flavours, have already enjoyed success at the Dublin Horse Show, filling a need in the equestrian industry for horse treats without the health risk. While his “pick and mix for horses” is certainly a niche market, Carroll’s deep personal involvement and passion for the industry was evident – tangible in the buckets of horse treats that judges were encouraged to smell, but not to eat. Horse goodies weren’t the only thing on the menu however, as Richard McSweeney pitched his app, QuikServe, as the salvation of Dublin’s nightlife. Allowing customers to place orders on their phone and approach the bar once their drinks are ready would, in theory, reduce the queues at the bars of pubs and clubs with which we are all familiar. The main concern for these Trinity entrepreneurs was efficiency, but only one team ventured into the world of eco-friendly innovation. Tommy Torrades and Liam Collins pitched their idea, Fire Bean, as a way forward in environmentally conscious coffee consumption. Despite our daily coffee runs, most students are not aware that coffee grinds combined with wax can provide an eco-friendly alternative to fire-starters or firewood, producing less emissions and reducing waste. The healthcare sector was also prevalent, with physiotherapy student Hithesh Shaji, and his teammates Ahmed Ahmed and Amjad Yousif, presenting a product combining tech with improving the quality of life for fall-risk patients. Their product idea, Fitzy, is not yet at the prototype stage, but would provide shock-absorbant clothing and a built-in emergency contact system in case of a fall. Coupled with an app and a website of exercise regimes for, in particular, the elderly, Fitzy is an innovative yet ambitious proposal for the healthcare sector. The winning proposal was also along the healthcare lines, from Francesco Tai Bernardelli, and his app Talka. This startup is aimed at bridging the gap between speech-therapy patients and their speech therapist. By using voice-controlled games, Talka would encourage patients, particularly children, to practice vocal sounds at home – an exercise that is crucial to their speech therapy. This winning pitch combined the best of the entrepreneuring ideas showcased on the night: filling a gap in the market, providing an efficient service, and improving quality of life for its users. The runner-up prize went to Bounce, exhibiting the dominance of technology and app usage at the forefront of entrepreneurship. As a major event for TES, the 2019 Dragon’s Den competition was testament to the growth of student entrepreneurial culture. With initiatives such as LaunchBox, College has undoubtedly been encouraging student startups, however, the dynamism of TES and their competitors spells a bright future for Trinity’s entrepreneurial students.